The UK's most senior military officer has warned of a new threat posed by Russia to communications and internet cables that run under the sea. 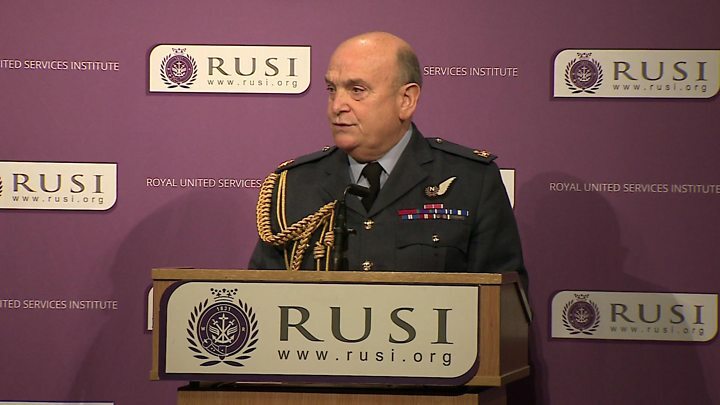 Air Chief Marshal Sir Stuart Peach, the chief of the defence staff, said Britain and Nato needed to prioritise protecting the lines of communication. He said it would "immediately and potentially catastrophically" hit the economy if they were cut or disrupted. Could Russian submarines cut off the internet? The world's submarine network comprises an estimated 213 independent cable systems and 545,018 miles (877,121 km) of fibre, according to a recent report for the Policy Exchange think tank. But it said a lack of formal state ownership meant cables do not have strong protection in international law. Despite that, an estimated 97% of global communications and $10 trillion in daily financial transactions are transmitted by cables under the ocean. Speaking to the Royal United Services Institute defence think tank, Sir Stuart said the vulnerability of undersea lines posed a "new risk to our way of life". He said Nato had prioritised the protection of the cables "in response to the threat posed by the modernisation of the Russian navy, both nuclear and conventional submarines and ships". He said it was "very, very important" to understand how crucial that mission was for Nato, "because Russia in addition to new ships and submarines continues to perfect both unconventional capabilities and information warfare." The UK and its allies needed to "match and understand Russian fleet modernisation", he added. Fears of Russia cutting, disrupting or "wire tapping" undersea communication lines are growing. Defence and intelligence chiefs see not just increased Russian submarine activity, but its willingness to use unconventional asymmetric warfare. In highlighting this threat, Air Chief Marshall Peach was admitting Britain and its Nato allies were ill-prepared to deal with the prospect of such an attack. There's been a significant increase in Russian submarine activity in the North Atlantic, particularly the GIUK (Greenland, Iceland and the UK) gap. Britain certainly doesn't have enough ships, submarines and aircraft to mount a constant watch. The UK will be getting new maritime patrol aircraft in the next decade, but for now has had to rely on the help of other Nato aircraft to hunt down submarines. Nato's former top military Chief Admiral Stavridis recently said: "We've allowed this vital infrastructure to grow increasingly vulnerable and this should worry us all." Sir Stuart said: "There is a new risk to our way of life, which is the vulnerability of the cables that criss-cross the seabeds. According to the Policy Exchange report - published earlier this month - many cable systems are potentially at risk. "Undersea cables are the indispensable infrastructure of our time, essential to our modern life and digital economy, yet they are inadequately protected and highly vulnerable to attack at sea and on land, from both hostile states and terrorists," the report concluded. Conservative MP Rishi Sunak, author of the report, warned a successful attack on the UK's network of undersea communications cables could deal a "crippling blow" to the country's security and economy. He said the locations of the cables were "both isolated and publicly available" and a successful attack would be an "existential threat to our security". Writing a foreword to the document, Admiral James Stavridis, a former US Navy officer and ex-Nato supreme allied commander, said: "It is not satellites in the sky, but pipes on the ocean floor that form the backbone of the world's economy." He also warned of a potential threat from China and Iran, as well as Russia. He called for the creation of more "dark cables", to be kept in reserve, and said Nato must be prepared to defend global submarine cables, if necessary. It comes after a ship dragging its anchor cut three undersea internet cables connecting the Channel Islands to the UK last year. It resulted in slower internet connections and phone problems across the islands. The internet has been the driving innovation of 21st Century life but the world started to become "connected" more than 160 years ago. The race to lay an undersea or "submarine" cable began soon after the first telegraph signal was sent in the 1830s. By 1850 Britain and France were linked. Archaeologist Cassie Newland, who last year curated an exhibition at London's Guildhall Art Gallery on the laying of a transatlantic cable in 1856, has described the efforts as the "talk of the age, the Victorian equivalent of the Apollo mission". The London-based Atlantic Telegraph Company had backing from the British and US governments and two Navy vessels started to lay a copper cable insulated in the natural plastic gutta-percha on a 2,300 miles route between the west coast of Ireland and Newfoundland. It was not until August 1858 that they were successful, an achievement marked by Queen Victoria sending the first transatlantic message to US President James Buchanan. By 1870, there was a cable between Britain and India, and Australia followed two years later. The whole world was connected in 1902 with the laying of cables spanning the 6,000 miles between Manila and San Francisco. Investment in undersea cables did not, of course, stop and the fibre-optic lines of today carry more than 97% of all communication traffic.